Temperature control is a common operation in the industrial arena. Its application can range across solids, liquids, and gases. The dynamics of a particular operation will influence the selection of instruments and equipment to meet the project requirements. In addition to general performance requirements, safety should always be a consideration in the design of a temperature control system involving enough energy to damage the system or create a hazardous condition. Let's narrow the application range to non-flammable flowing fluids that require elevated temperatures. In the interest of clarity, this illustration is presented without any complicating factors that may be encountered in actual practice. Much of what is presented here, however, will apply universally to other scenarios. What are the considerations for specifying the right equipment? First and foremost, you must have complete understanding of certain characteristics of the fluid. Specific Heat - The amount of heat input required to increase the temperature of a mass unit of the media by one degree. Minimum Inlet Temperature - The lowest media temperature entering the process and requiring heating to a setpoint. Use the worst (coldest) case anticipated. Mass Flow Rate - An element in the calculation for total heat requirement. If the flow rate will vary, use the maximum anticipated flow. Maximum Required Outlet Temperature - Used with minimum inlet temperature in the calculation of the maximum heat input required. Heat Source - If temperature control with little deviation from a setpoint is your goal, electric heat will likely be your heating source of choice. It responds quickly to changes in a control signal and the output can be adjusted in very small increments to achieve a close balance between process heat requirement and actual heat input. Sensor - Sensor selection is critical to attaining close temperature control. There are many factors to consider, well beyond the scope of this article, but the ability of the sensor to rapidly detect small changes in media temperature is a key element of a successful project. 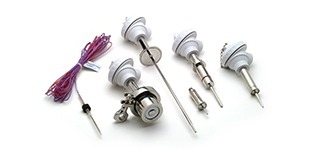 Attention should be given to the sensor containment, or sheath, the mass of the materials surrounding the sensor that are part of the assembly, along with the accuracy of the sensor. Sensor Location - The location of the temperature sensor will be a key factor in control system performance. The sensing element should be placed where it will be exposed to the genuine process condition, avoiding effects of recently heated fluid that may have not completely mixed with the balance of the media. Locate too close to the heater and there may be anomalies caused by the heater. A sensor installed too distant from the heater may respond too slowly. Remember that the heating assembly, in whatever form it may take, is a source of disturbance to the process. It is important to detect the impact of the disturbance as early and accurately as possible. Controller - The controller should provide an output that is compatible with the heater power controller and have the capability to provide a continuously varying signal or one that can be very rapidly cycled. There are many other features that can be incorporated into the controller for alarms, display, and other useful functions. These have little bearing on the actual control of the process, but can provide useful information to the operator. Power Controller - A great advantage of electric heaters is their compatibility with very rapid cycling or other adjustments to their input power. A power controller that varies the total power to the heater in very small increments will allow for fine tuning the heat input to the process. Performance Monitoring - Depending upon the critical nature of the heating activity to overall process performance, it may be useful to monitor not only the media temperature, but aspects of heater or controller performance that indicate the devices are working. Knowing something is not working sooner, rather than later, is generally beneficial. Controllers usually have some sort of sensor failure notification built in. Heater operation can be monitored my measurement of the circuit current. Any industrial heater assembly is capable of producing surface temperatures hot enough to cause trouble. Monitoring process and heater performance and operation, providing backup safety controls, is necessary to reduce the probability of damage or catastrophe. High Fluid Temperature - An independent sensor can monitor process fluid temperature, with instrumentation providing an alert and limit controllers taking action if unexpected limits are reached. Heater Temperature - Monitoring the heater sheath temperature can provide warning of a number of failure conditions, such as low fluid flow, no fluid present, or power controller failure. A proper response activity should be automatically executed when unsafe or unanticipated conditions occur. Media Present - There are a number of ways to directly or indirectly determine whether media is present. The media, whether gaseous or liquid, is necessary to maintain an operational connection between the heater assembly and the sensor. Flow Present - Whether gaseous or liquid media, flow is necessary to keep most industrial heaters from burning out. Understand the limitations and operating requirements of the heating assembly employed and make sure those conditions are maintained. Heater Immersion - Heaters intended for immersion in liquid may have watt density ratings that will produce excessive or damaging element temperatures if operated in air. Strategic location of a temperature sensor may be sufficient to detect whether a portion of the heater assembly is operating in air. An automatic protective response should be provided in the control scheme for this condition. Each of the items mentioned above is due careful consideration for an industrial fluid heating application. Your particular process will present its own set of specific temperature sensing challenges with respect to performance and safety. Share your requirements with temperature measurement and control experts, combining your process knowledge with their expertise to develop safe and effective solutions.